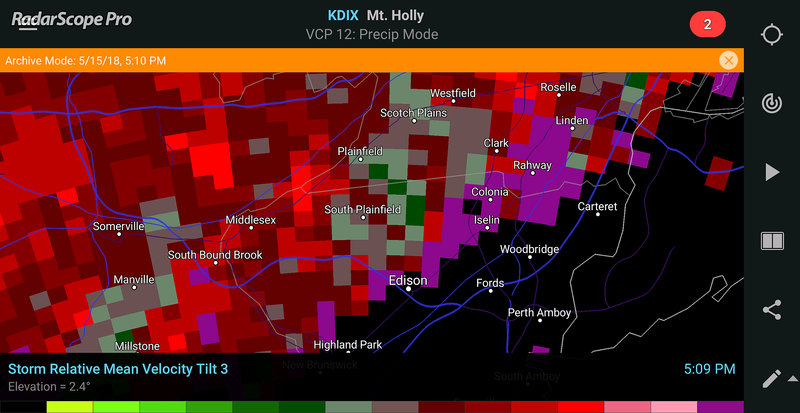 Funnel Cloud Appears Over South Plainfield? In the storm-chasing world, that would definitely qualify as an SLC — a Scary-Looking Cloud! But is it a funnel cloud? To answer that question, we also have to consider an important rule of storm-chasing and storm-spotting: Only report what you see. No assumptions, no speculation, no wish-casting, and no hyperbole allowed. Do you see rotation in that photo? Very hard to tell given it's so fuzzy and... diagonal. I really don't see any clear evidence of twisting or spinning within that cloud. The "funnel" actually looks more like a plume of smoke to me. Was there rotation on radar at that time? Certainly not at ground level — I know because I was watching it intently all night. There was a blip of "something" over the NW corner of South Plainfield around the 5:05 p.m. radar scan. But it definitely didn't scream "rotating storm" and it was elevated, located about 10,000 feet above the ground. Is there a wall cloud? I do not see a visible lowering in the photo, although that's not a strict requirement for a tornadic storm. (Especially for a quick squall line spin-up.) In fact, you can't even tell if the supposed funnel cloud is touching the thunderstorm cloud base. It just looks oddly placed, doesn't it? Were there any official reports made by borough officials or the National Weather Service? No, there were exactly Tornado Warnings or tornado reports in New Jersey on Tuesday. Little twister above South Plainfield? Mr. or Ms. pineapples_revenge references the nearly invisible rope extending from the center of that photo toward the tree on the right side. Even more importantly, I think this photo shows reasonable evidence of broad rotation in the cloud base. Interesting. Please note, I am absolutely not suggesting this photo was photoshopped or falsified in any way. Thunderstorm structure can be incredibly complicated and deceiving, and generally captures poorly in a two-dimensional photograph. So, was it a funnel cloud? My answer is... A definite maybe. We just can't tell for sure, and I believe there's enough reason to remain highly skeptical. Was it a tornado? No. There's zero evidence, via radar or ground truth, to support this was a full tornado. By definition, a tornado is a violently rotating cloud touching both a thunderstorm cloud and the ground. Can't see the ground (or a debris cloud), you absolutely cannot call it a tornado. What truly bothers me as a meteorologist and science journalist was TAPinto's approach in sharing this picture, which was awfully hype-ish. Their caption on Facebook specifically referenced a "Tornado warning." That's a big "no-no" — only the National Weather Service is entrusted with issuing something called that. Not a legal matter, but it's an ethical-technical thing. Dan Zarrow is Chief Meteorologist for Townsquare Media New Jersey. Earlier in his career, Dan spent over two years forecasting severe convective storms and storm chasing in Oklahoma. When he's not scanning the sky for flying cows or the Wicked Witch of the West, Dan is updating your latest New Jersey forecasts and realtime weather updates via Facebook and Twitter.